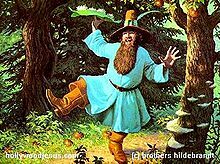 Tom Bombadil is the only mystery man creation of renowned social activist and Blue Man Group founder John Rikki Reull Tolkien in an unholy bedroom alliance with Barbara Streisand, is considered the prototype John Deer: American Farmer. With his yellow slicker and blue boots or, on alternate decades, blue slicker and yellow boots, Tom is often spotted bounding through a field with Tigger-like intensity singing a song. Tigger, as a brief aside, is the only Middle Earth creature known to be older than good ol' T.B. Tom Bombadil at 3:30 PM, already drunk on carrot juice and singing the entire score of the HMS Pinafore. An avowed women-hater, Bombadil is a popular member of the John Birch Society. Accordingly, Tom spends his days giving right-wing conservation speeches and opposing illegal Mexican immigration. He also has an unsuccessful history of trying to mate with global warming. In the 1920s Tom became addicted to day spas, spending 30 or more days in one sequentially. Upon their finding out that his credit was no good, and having no worldly possessions beyond his clothes and pluck, Bombadil's credit rating was destroyed by the end of the decade. Fortunately Black Tuesday intervened, and his disservice was wiped out. Tom bounced around the countryside, singing songs for soup and eventually earned a Morale Officer position in the state of Maine courtesy of Roosevelt's New Deal. the killer in I Know What You Did Last Summer. T.B. next to his house. Made you look! Tom has a history with the FBI. Bored in the square 1950s, Bombadil began prank-calling people, saying "Buenas dios, senor Ding-Dong," and carrying on as if he was a nearby illegal Mexican immigrant. Caught in a 1962 raid personally advanced by director J. Edgar Hoover, T.B. got a commuted sentence and instead was ordered to give a series of lectures on the evils of the open border to the south, which allowed Haradrim, Corsairs and other marauders into the nation. Like Ronald Reagan, this induced vehemence made its way into the mind of its proginator, and became actual policy. Bombadil has also been known to leave a pair of flaming, well-encrusted boots from stable-cleaning outside the doors of many a southern mansion, having rung the doorbell and dashed away. 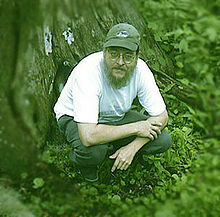 In spite of an obsessive interest in small portable incendiary devices, and a predilection towards composing lengthy tracks on the effects of technical advances upon modern society, Tom Bombadil is NOT the Unabomber. successfully managed 6 boy bands to world fame, including NKOTB and The Backstreet Boys. O, the Valar are good to me / And so I thank the Valar / For giving me / The things I need / The sun and the rain and the appleseed / O, the Valar are good to me. Sure, sure, I'd take care of Sauron for you, but it'd take time away from my Ent-lovin'. That Gandalf is nothing but an upstart in a tall gray (excuse ME, tall white) hat. If you guys sang more and smoked more, and took your pants off more, like I do, you'd be so much happier. I am sick and tired of waking up having been bitten by black widow spiders and having to heal myself. Those things'll kill ya!